Created in 1992 by Omashar & Solara. Time: Whatever you feel is appropriate. Continue for as long as the dance maintains its energy and focus. The Lotus Dance is one of our most subtle dances and represents the Lotus Heart. We slowly dance in two circles as petals of the Lotus of True Love, gently expanding that love outwards to the planet and returning to the pure Core Essence of Love. This dance is performed in silence with almost closed eyes and powerfully anchors the Lotus Heart wherever it is danced. It is magnificent outside at night under the stars. The mastery of the Lotus Dance lies in the total surrender to the subtle energy currents of PURE HEART LOVE of the Lotus Heart. If you remain conscious at all times of all the petals of the Lotus breathing the Lotus Love in and out, it will greatly enhance your experience of this subtle Sacred Dance. After a period of perhaps eleven seconds or so, the inner circle will sense it is time to VERY SLOWLY part hands & raise them into the One Heart position before taking two steps backwards. Here, they stop and ground the energies deep into the Earth before they raise their arms upwards and outwards while breathing out PURE HEART LOVE of the Lotus Heart to all. Next, with a movement of graceful surrender, their outstretched arms slowly fall to their sides. Then they move forward and put their arms under the arms of the inner circle so they can join hands in front of the torsos of the existing inner circle. After a few moments in which both circles are entwined in enhanced Oneness, the old inner circle will raise their hands into the One Heart, step back and repeat the process. Thus the petals of Lotus open, expand and return to ever deeper Oneness. 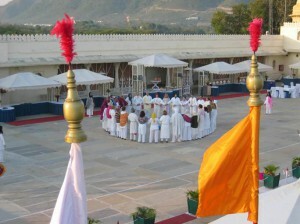 Throughout the Dance, the inner circle will embody and anchor the purity of the Love of the Lotus Heart while the outer circle will expand PURE HEART LOVE outwards. The Lotus Dance can conclude any time after the group feels unified. 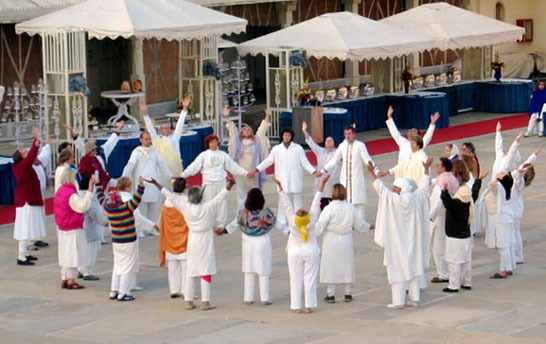 The inner circle, acting as One Being will, instead of parting hands as they raise into the One Heart as before, continue to hold hands as they raise them up and over the heads of the outer circle, thus forming a new, separate outer circle. This circle will lower their joined hands and rotate to the right while the inner circle rotates to the left.